Welcome to St Luke's Church Norland. Welcome to the ‘Little Grey Church on the hill’. 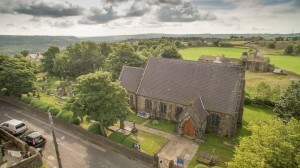 We are a small, friendly and inclusive church which is open to all, sitting at the heart of the village of Norland. of Norland village and the surrounding villages. Sometimes our congregation is quite small but on special occasions, our church can be filled to bursting point! This year we are fundraising for repairs to the church organ, we will be holding various events throughout the year to help us reach our target, so please join us on these events, we will publish details on the website under events and also on our Facebook page. Alternatively you can donate by cheque making it payable to Norland Church or by handing cash into church to a member of the PCC. We invite you to join us in our worship at 3.30pm on Sundays. Morning Prayer is also held at 9.15am on Mondays. Check out our Events page to see what is going on at St Luke’s or follow us on facebook. We hope to see you soon!